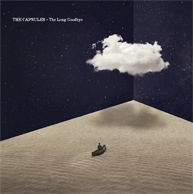 · Our new album, "The Long Goodbye", is out now on Saint Marie Records! Pick it up at iTunes, Amazon, or your favorite retailer! · We have just launched a brand new On-Demand T-Shirt Shop with lots of new T-Shirt designs, including one for our brand new album, The Long Goodbye! · Check out our brand new Music Video for "Super Symmetry", off our new album, The Long Goodbye! · The Capsules have just signed to Saint Marie Records! · The new Music Video for "Time Will Only Tell" is out now! Check out the permiere on Muzu.tv! · The second music video from NLSS is now up! Check out the video for "Across the Sky" premiered on Under the Radar! · The first music video for NLSS is now up! Check out the video premiere for "Our Apocalypse" on Magnet Magazine's website! · The Capsules fourth album Northern Lights & Southern Skies is out now! Pick it up on iTunes here or on CD via CD Baby. · March 12, 2014 - The Capsules will be playing at Shangri-La in Austin, TX for the Midcoast Takeover during SXSW! · March 13, 2013 - Austin, TX at Shangri-La for the Midcoast Takeover's Showcase at SXSW! · April 6, 2013 - Kansas City, MO at the Record Bar for the Middle of the Map Fest! · September 14, 2013 - Dallas, TX at the Palladium Ballroom for Gearbox Software's Community Day! To stay up to date on news for The Capsules, follow us on Twitter, Facebook, MySpace, YouTube or Join Our Emailing List!